My recent review of bourbon and rye whiskies got me thinking about new ways to incorporate whiskey into tropical drinks. While whiskey may not have quite the same range as rum, there still quite a bit of variety that can be mixed to provide new flavor combinations that are unlikely to be found in a single product. Combine all ingredients, shake with ice and strain into a chilled old fashioned glass. Apologies if I got the Gaelic wrong. The internet can only help so much. The Bushmill's Irish whiskey is something of an odd beast as it's aged in used oloroso sherry barrels for some of its life, which adds a distinctive fruity raisin flavor to the usual single malt character. There's also just a hint of wine, which makes me think of the brandy notes in rhum agricole. Rittenhouse has tons of spicy character, somewhat analogous to a full-bodied Jamaican rum. So it made a certain amount of sense in my mind to put the two together into a sort of whiskey Mai-tai. Ultimately, this is following the basic path of tiki drinks: start from a simple sour and elaborate by using multiple liquors, fruit juices and sweeteners to make a complex yet unified drink. Here we've started off with a simple whiskey sour, and elaborated on the ingredients to make something distinctive. By combining a floral, fruity whiskey with a funky, somewhat raw whiskey the drink has a number of different layers of whiskey flavor. The lemon juice gives it a bit of zip, while the orange liqueur gives it some sweetness and rounded fruity flavor. The orgeat has a distinct nuttiness that syncs up well with the whiskies. While I'm not the first person to think of making a whiskey-based mai-tai, I'd like to think that this is a decent elaboration and in keeping with the spirit of tiki drinks. While a bit of a departure from the original, the inspiration for this drink came from the Waitiki corner of the Cocktail Journal. I wanted to find a way to integrate the smoky flavor of scotch, a notoriously difficult liquor to mix with, into a tiki drink. Again, I'm far from the only person to head in this direction, but I think the results speak for themselves. Unsurprisingly, the scotch tends to dominate the nose. There's a heavy dose of peaty-smoke, though a healthy whiff of cinnamon isn't too far behind. The smoke is much more subdued on the tongue. There is a distinct grainy flavor from the whiskies, with a rounded fruitiness from the citrus and passionfruit and various spicy notes from the syrups. Altogether a quite pleasant drink to sip. Especially if you're like me and have an organic chemistry problem set to wrap up. While I should be returning to the world of rum in the near future, it's been fun to see how far I could push distinctly American, Irish and Scottish spirits into the faux-tropical world of tiki. After trying a few different types of commercial ginger beer (I'm especially looking at you, Reed's Extra Ginger Brew), none of them really seemed to have the kick that I was looking for. I tried Jeffery Morgenthaler's method, which was good, but always seemed to have a yeasty taste to it. The standard method for making ginger syrup, simmering chunks of ginger in simple syrup and filtering the resulting mess, worked alright but seemed to lose its kick fairly quickly. I finally despaired and gave up hope for a while. Then, as luck would have it, I stumbled upon Summit Sips. While browsing the archives, I came upon a new recipe for ginger syrup. This, folks, is the way to go. All the convenience of ginger syrup, which lets you make as little or as much ginger beer as you want, with the snappy tasty of Mr. Morgenthaler's recipe. Truly a gift from the gods, especially if one happens to have a bit of a sore throat or a stuffed up nose. Without the ginger syrup, this would be a passable but unremarkable cocktail. Some decent fruit flavor, the smooth sweetness of honey and gold Puerto Rican rum, which is usually good, but doesn't particularly stand out in comparison to Jamaican or Guyanese rums. The ginger syrup adds another new dimension to the drink, giving it snap and spice. 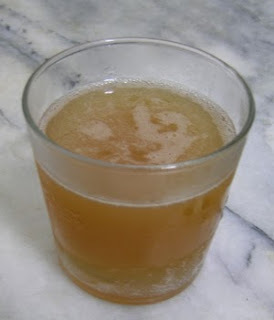 For those who like that ginger bite a bit more, you could easily bump the ginger syrup up to 1 tsp without disturbing the balance of the drink, though you might want to use a hair less honey syrup so that it doesn't get too sweet. Overall, it's a fairly simple but definitely tasty cocktail. While I am far from the first person to venture into this realm, I wanted to add my fairly simple but tasty recipe to the crowd. Toast the almonds until fragrant, but not burnt. Blast the almonds into little pieces with a food processor. Simmer the almonds and water together at very low heat for an hour or two. By that point there should be an obvious layer of extracted oils from the almonds floating on top of the mixture. Strain the mixture through a tight mesh sieve or cheese cloth to remove the solids. At that point, you should check to see how much volume you have. It'll probably be about half the volume of water you put in. 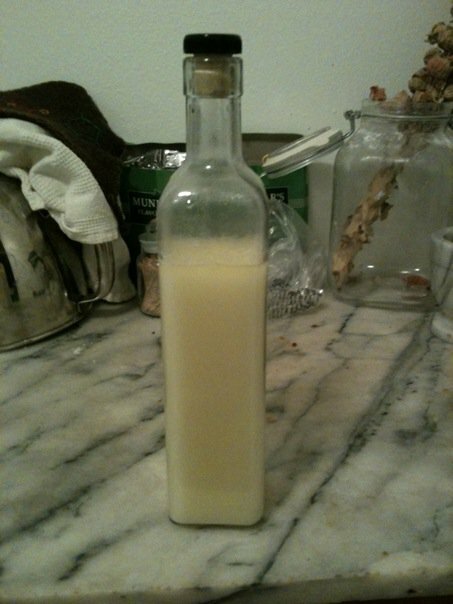 Mix the almond milk you've just made 1:1 with simple syrup. Toss in a bit of vodka or grain alcohol if you like so that it will keep longer. This syrup has a really great toasted almond flavor. Additionally, I find that it works well to smooth out rougher flavors and also gives just a bit of frothy head to shaken drinks. One drink in that vein is on Death & Co's menu. I had to guess at the proportions, but it turned out to be quite tasty. This is a great cocktail to sit and sip. Even with a fairly healthy dose of simple and orgeat syrups, it manages to be balanced, even edging towards being dry. The nutty flavor of the Oloroso sherry and the orgeat fit rather well with the spicy flavors of the rye whiskey. The herbal notes of the bitters also fit well with the rye grain flavors, while the juices give the drink a bit of snap. While I have no clue how this compares to the drink made at D&C, I'm pretty pleased with how this turned out. Just in case it wasn't already abundantly clear, I rather like tiki drinks. And as many are now showing they weren't always the syrupy sweet neon disasters that they became after the first golden age of tiki. Instead, the originals, many pioneered by Don the Beachcomber and Trader Vic were exquisitely balanced potions with significant amounts of thought behind their construction. To me, one of the emblematic tiki drinks is the Navy Grog. Many tiki drinks began their lives as elaborations of a few basic recipes such as the daiquiri or the Planter's Punch. Starting with the simple combination of rum, citrus and sugar, there are a host of ingredients that can be slotted into each category to build an endless array of drinks. Another key feature of tiki drinks is the use of multiple rums to produce flavors that no single rum could contain on its own. The Navy Grog fits those features to a T, with multiple rums backed up by lime and grapefruit juices with honey syrup to sweeten the pot. All easily fit within the basic mold, but combine to produce a drink with a very different character from the daiquiri of yore. I will admit that I usually stray from the recipe just a bit. Since I usually like my drinks a bit sweeter, the honey syrup (2:1) gets bumped up by a quarter of an ounce. From what I understand, there may have been a few issues translating the older Grog Log and Intoxica recipes, which used straight honey, to the Remixed recipes that call for 1:1 honey syrup, so it's probably keeping in line with how the drink is meant to taste. Additionally, while the original recipe calls for light Puerto Rican rum I tend to use gold rums, such as Ron Abuelo 7 Años or Bacardi 8 Años to give the drink a bit more depth. However, if you'd like to have a bit more snap, Flor de Caña Extra Dry might not be amiss. Where you really get to play with the nature of the drink comes from the Demerara and Jamaican rums. These days we are blessed with quite a number of rums from each country, all with their own distinctive flavors. This allows you to construct very different drinks depending on what rums you pick. Want something more assertive that'll give you a kick in the pants? Use some Smith & Cross or Coruba for the Jamaican or Lemon Hart 80 for the Demerara. Want a drink that's smooth as the honey going into it? Shoot for Appleton 12 Year for the Jamaican or El Dorado 5 or 12-Year for the Demerara. Shooting for a balance between the two extremes? Pick Appleton V/X for the Jamaican and El Dorado 5-Year for the Demerara. I'm sure there are plenty of other options (Plantation Jamaican and Guyana rums are on my list to buy), but even just picking from my personal collection there's an enormous amount of flexibility. To wrap this all up, the Navy Grog is a very tiki tiki drink that is well worth your while to mix up. Even with a fairly short list of ingredients (for a tiki drink), there's a lot of room to play around with flavors and make something new and exciting each time. While it's arguable that rum was America's first national spirit, these days whiskey is likely to be the first drink that they associate with the country. 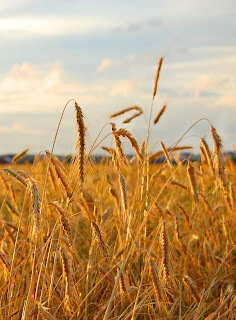 It didn't take long after settlers began moving west, especially once they had crossed the Appalachian Mountains, for them to realize that it was much more efficient and profitable for them to turn their grain into whiskey and sell that than it was to sell the grain itself. It didn't take long before America was a nation of whiskey drinkers and boy did they know how to put it away. By the early 1800s there were about 14,000 distilleries in the country producing millions of gallons of whiskey . The average American drank roughly five gallons of absolute alcohol in a year, translating roughly into a normal bottle of 80-proof booze a week. Given that it was also a time of religious revival and a not insignificant portion of the population were tee-totalers, that average hides a rather bimodal distribution with a relatively small number of people consuming most of the alcohol. American whiskies have generally fallen into two categories: bourbon and rye. In each case, this is primarily determined by the mash bill, with bourbon containing more than 51% corn and rye containing more than 51% rye. 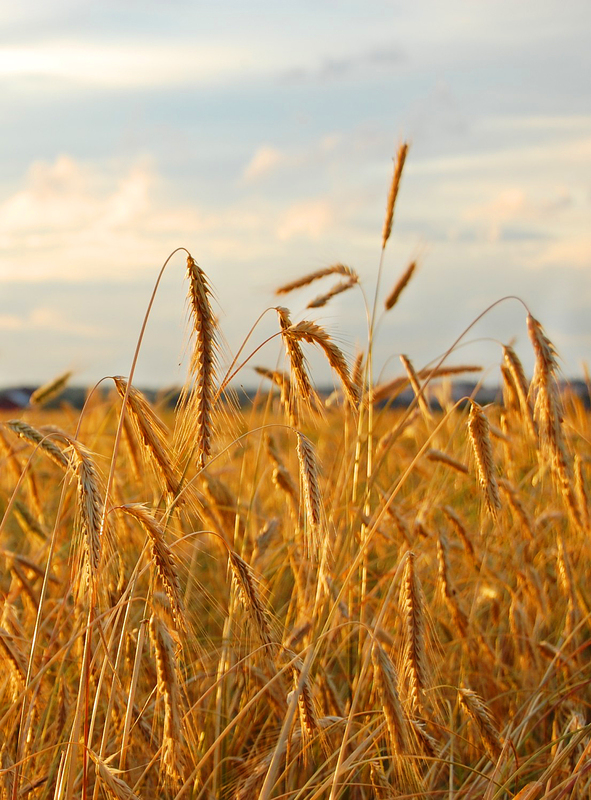 In both cases they are usually a mixture of corn, rye, barley and sometimes wheat, though there are a few 100% ryes on the market right now. Also, both types of whiskey must be aged in new, charred oak barrels (this creates a ready supply of used bourbon barrels that are often used to age rum). While the flavor is largely influenced by the mash bill, the barrel aging also rounds off some of the sharper edges of the spirit and adds vanilla, caramel and wood flavors to the mix. On a whim I decided that I should finally get around to trying some whiskey, as it was one of the spirits that I hadn't tried. After poking around some of my favorite booze blogs for recommendations, there seemed to be a consensus that Bulleit was a really great value. I'll have to admit that my initial impressions were not overwhelmingly positive. Despite being a reasonably stiff spirit at 90 proof, it just wasn't punching through drinks in the way I expected it to. Compared to my usual base liquor of choice, rum, bourbon doesn't have quite the same heft. But after a little playing around, I finally figured out how to make it work well. 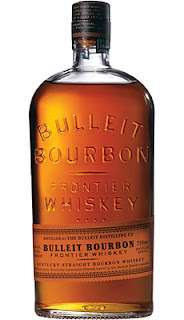 Bulleit Bourbon has a higher proportion of rye in the mash bill than a lot of other bourbons, which gives it a somewhat spicy and snappier character to counterbalance the smooth caramel sweetness that one normally finds in bourbon. All in all, this is a great spirit and a fine bridge between traditional bourbons and rye whiskies. And it makes a mean tiki drink. Combine all ingredients, shake with ice and strain into a chilled rocks glass. 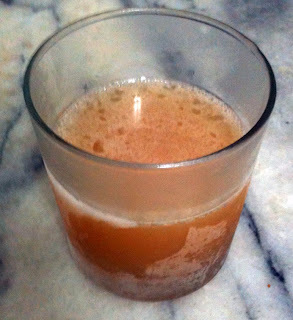 The original recipe called for ginger beer, but I prefer a bit more snap from ginger syrup made with fresh ginger juice. All of the spicy ingredients play nicely with the bourbon without completely obliterating it. The extra oomph that Bulleit brings to the table helps to give the drink some backbone. All in all, a great drink. Normally, I have a hard time trusting liquor that comes with a plastic screw top. Even the metal ones are a bit better, but corks can't cost that much more and just look classier. But Rittenhouse Bonded is gold in disguise. As noted above, rye whiskey takes the normal bourbon mash bill and more or less inverts it. So there's a whole new layer of flavors riding on top of the sweet-ish corn and caramel flavor of bourbon. There's a lot of spice, primarily cinnamon, grainy rye, a bit of wood and a touch of pepper. Together, the result is fairly dry but quite balanced. Surprisingly for being 100-proof, there's almost no alcohol flavor and very little burn. The best thing I can say about this whiskey is that it has depth. Which is probably why it's currently a darling of mixologists. Some liquors won't assert themselves very well when you want to pair them with other strongly flavored ingredients. Rittenhouse will easily hold its own without completely dominating a drink. And for something so distinctly American, it also works rather well in tiki drinks. This is a simple substitution into the Donga Punch, but it works just as well as the original. I suspect that this is partially because many varieties of rhum agricole clock in at 100 proof as well, so the recipe is made to balance with a strong base liquor. Subbing in cognac works well too, which is part of why I still wish that I could get some Force 53. Rittenhouse works perfectly here, both because of its strength and because the spicy flavor of the whiskey synchronizes perfectly with the cinnamon syrup, while both are balanced by the acidic and bitter citrus flavors. 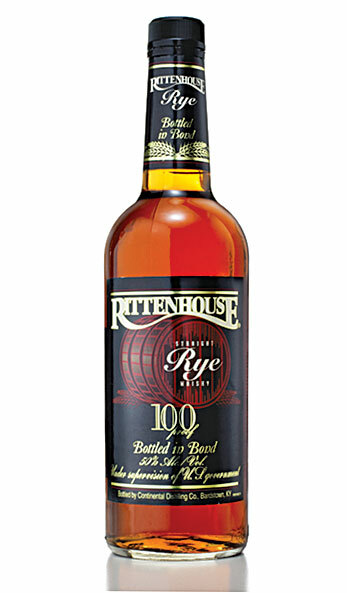 If you enjoy whiskey at all, you owe it to yourself to go pick up a bottle of Rittenhouse (if you can find it). At roughtly $20, it's pretty hard to beat in terms of value. Watman, Max. Chasing the White Dog: An Amateur Outlaw's Adventures in Moonshine. 2010.